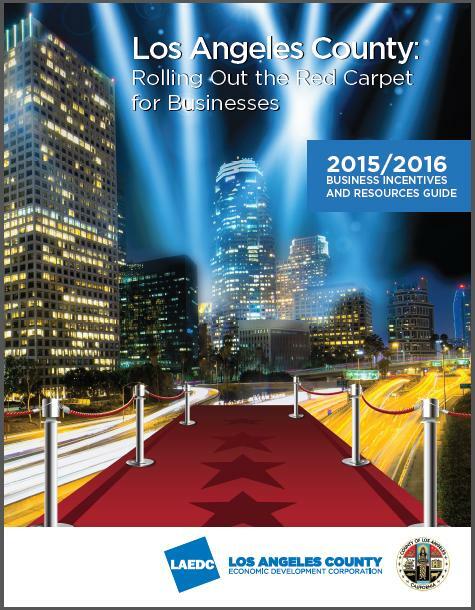 The new 2015 LA County Business Incentives Guide is now published. Click HERE to view and download it. Los Angeles County has a variety of incentive programs available to both small and large businesses. However, the majority of bigger incentives are targeted, but not limited, to manufacturing companies (manufacturing, high tech manufacturing, and R&D) which plan to utilize large numbers of employees in the targeted community. Incentives should not be the only reason why one should consider a location, but could be one of many factors that could help lead to a final location decision. Potential business incentives may be offered at the federal, state and local level. Of the 88 cities in Los Angeles County, the City of Los Angeles offers the most in terms of incentive programs. Incentives typically fall into two categories: legislated and discretionary. State and federal legislated incentives are “on the books” and available to any business that meets stated criteria. Discretionary incentives are customized and provided by certain cities and only for specific projects on a case-by-case basis. In almost every case, discretionary incentives come into play when a community is trying to attract a large business operation that brings significant investment into that community and will have a substantial impact on jobs created. Rarely will either legislated or discretionary incentives turn a poor location into an acceptable one. Therefore, they should be considered only after a number of locations have been identified that satisfies a company’s key operation requirements. But among roughly equal alternatives, incentives can represent a decisive factor. Incentives should be combined with other factors as part of a strategic comparison of contending site locations. Financial incentive availability depends on a variety of factors including the state or community’s needs and the project’s economic impact. In general, incentives are likely to be minimal in prosperous areas unless the project is viewed as highly desirable by local authorities. On the other hand, areas in dire need of new jobs and tax revenue are more likely to offer larger packages. Until all parties meet to discuss the potential size and economic impact of the project it is difficult to offer a preliminary estimate of incentives to be offered. Sometimes just being in L.A. (Los Angeles County) and being identified with L.A. (the creative L.A. Brand) is a major incentive that is often overlooked. Please contact LAEDC’s Business Assistance Program and our regional managers, who assist businesses with strategic consulting at no cost. Our regional managers are experts at knowing which incentives fit your needs.